Necronomicon wrote: 4.16 showing incorrect temperature. I setted in options to update every 1 minute, but accuweather shows different data. probably you see different cities, but which have the same name. Same city, same country. Wouldn't post if this was the case. Last edited by LIMPET235 on July 26th, 2018, 6:05 am, edited 1 time in total. Thank you for this excellent extension. However I have a problem with the export/import settings function you've recently implemented: the "save settings" button does nothing and the "copy settings" button doesn't copy settings in the clipboard although the popup message says OK (as in download manager s3!). I'm running Firefox 60 ESR on W7 64-bit. Is it a known bug or is it a problem with my system? Necronomicon wrote: Same city, same country. Wouldn't post if this was the case. sorry, but I do not see the problem. DenBar wrote: However I have a problem with the export/import settings function you've recently implemented: the "save settings" button does nothing and the "copy settings" button doesn't copy settings in the clipboard although the popup message says OK (as in download manager s3!). Thank you very much, version 4.19 works fine! Realfeel, UV, visibility, pressure, humidity...all different. Thunderstorm vs partly sunny. And sometimes current temp can be off. Necronomicon wrote: Realfeel, UV, visibility, pressure, humidity...all different. Thunderstorm vs partly sunny. And sometimes current temp can be off. ForecastFox has only New York weather, and settings will not allow me to add a city or location. The options link “type in a city, zipcode or place of interest” opens a box, but typing a city name produces nothing. Meanwhile, I see links at the bottom left corner of the page flashing too fast to read, including http://www.s3blog.org and something about maps.???? and ???.googleapis.com. Suggestions? gibhenry wrote: ForecastFox has only New York weather, and settings will not allow me to add a city or location. The options link “type in a city, zipcode or place of interest” opens a box, but typing a city name produces nothing. Meanwhile, I see links at the bottom left corner of the page flashing too fast to read, including http://www.s3blog.org and something about maps.???? and ???.googleapis.com. Suggestions? Ghostery! That was the problem. Never used to be, but it's interfering with all kinds of stuff, so I disabled. it. I love your extension, really handy. One was Speed Dial, and now I have installed the Extension Group Speed Dial (https://addons.mozilla.org/en-US/firefo ... pspeeddial) and I have set that as my Home Page. Now the Weather Forecast isn't showing on that page (maybe a limitation of Firefox) but is it possible to show it there as well ?? 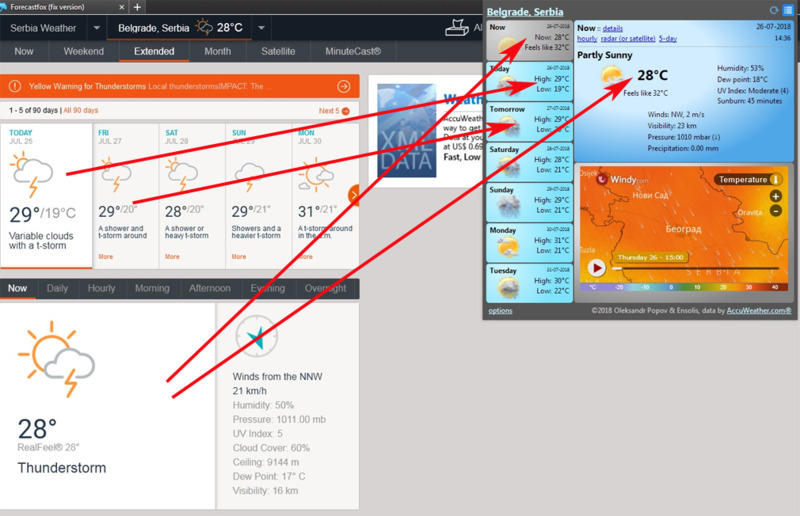 iammike wrote: Now the Weather Forecast isn't showing on that page (maybe a limitation of Firefox) but is it possible to show it there as well ??
. Forecast bar will not be displayed on internal Firefox and GoogleChrome pages, for example about:addons , about:config , chrome://extensions/ , chrome://settings/ , etc.
. Forecast bar will not be displayed on the WebExtensions pages "moz-extension://...." , "chrome-extension://...."
Mozilla changed the functionality in Firefox 60. Firefox 60 comes with a new preference called extensions.webextensions.restrictedDomains which lists domains that WebExtensions are not permitted to run on by default. I run an extension called RECAP, which helps people use an American federal court website. Recently, a user discovered that Forecastfox (fix version) was breaking our extension. We do some basic work around uploads and things of that sort that stopped working.